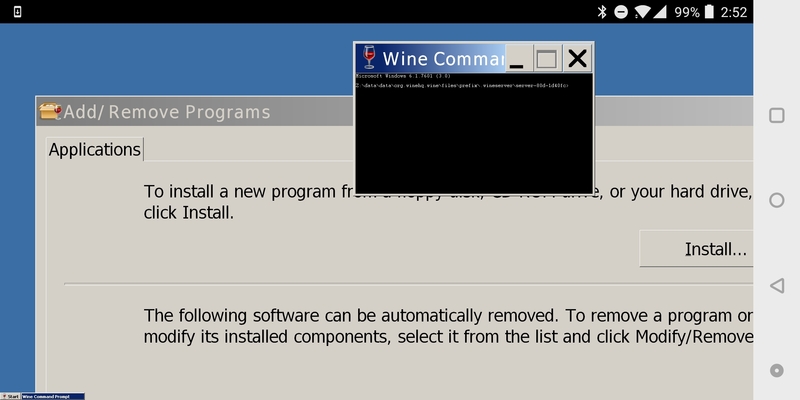 If you're not familiar with it, Wine is a free and open-source compatibility layer for running Windows programs on Unix-like operating systems. It has been in development since 1993, and can run a wide variety of Windows programs on Linux and macOS (though modifications or tweaks are sometimes required). CodeWeavers has been working on porting Wine to Android for the past few years, and the first alpha release arrived in August 2016. Although the company's products are commercial software, it does contribute many of its improvements back to the Wine codebase. Wine 3.0 was just released, and it's the first version you can install as an app on Android. Opening the app gives you a full-screen Windows display, much like the first builds of CrossOver for Android, with a Start menu at the lower-left corner. Support for audio and basic graphics is included. Since Wine for Android is in its early days, there are several major limitations right now. The app only fully opened on my OnePlus 5T - it crashed on my Galaxy Tab S and froze on my 2016 Pixel. The DPI scaling is also very buggy, and it's difficult to use on a touchscreen. The graphics driver doesn't support Direct3D yet, so many programs (especially games) won't work at all unless you can force them to use OpenGL. Wine is only a compatibility layer, and not a full-blown emulator, so you'll need an x86 Android device to take full advantage of it. Wine does support ARM devices, but you can only use programs that were ported to Windows RT. You can find a few examples here. The Wine project is working on using QEMU to emulate x86 CPU instructions on ARM, but that's not complete yet. If you want to try out Wine on your Android device (or Chromebook, if you have Developer Mode enabled), you can download the latest builds here. Make sure to grab either "wine-3.0-arm" or "wine-3.0-x86," and not one of the release candidate APKs.